This is exactly how speaking is. Fluent speech, just like fluid writing, is automatic. Sure, we pause our speech for various reasons. We don't think ever about where we should pause, though. We don't ask ourselves how fluent our speech is. We speak first. We revise our speech afterwards. But, why do students struggle with this? Two major reasons come to mind. Students are often afraid of being wrong. They want to do everything right the first time. It's part of our psychology. To be wrong is to admit deficiency. It's a sign of weakness, and we dislike vulnerability. We're conditioned to be proud of rightness and ashamed of wrongness. Unfortunately, foreign languages are too complex. You won't speak them perfectly on your first try. Your brain has to rightly coordinate phonological, semantic, and syntactic information. Meanwhile, you don't fully know what right or wrong speech is. You just know that you don't know. Worse yet, you have to risk being foolish to remove all doubt. "The evidence from the experimental language acquisition literature is very clear: Parents, despite their best intentions, do not, for the most part, correct ungrammatical utterances by their children." However, that barrier is more more easily overcome. It just takes some humility and some thick skin. Drop your pride and take criticism lightly, and you'll be fine. Besides, the second barrier is much more troublesome. Starting your first year in school, you're coached in analysis. You're taught to examine facts. You're taught to dissect complexity. You're taught to compose reasoned thoughts. You're taught to cite references. You're taught to fit the institutional ideal. From stickers on worksheets to high GRE scores, people mainly judge your intelligence on this skill. Yet, it's just one domain of mental activity. Such emphases on analysis impart a cognitive bias, as well. In psychology, it's called "the law of the hammer". Analytical hammer in hand, we'll try to pound every foreign subject. What's more, natural language looks just like a nail for it. It's bound by rules. It has guidelines. Experts can judge it as right or wrong. We can pinpoint errors. But, what good, deep analysis of language acquisition shows is that this is misguided. Analysis of language is like analysis of music. Sure, elements of language are its terms, its phrasal organization, its agreement rules, and such. Elements of music are its notes, tempos, and such, too. But, just like music is not the application of music theory, neither is language the application of a language theory. Theory comes later to explain what arises naturally. We can hum tunes and speak just fine without theory. The idea that, like learning a new genre of music, learning a new language requires this theoretical knowledge, is just plain false. The facts are in. It does more harm than good. Even its advocates only support "judicious" and "developmentally ready" uses of it. If analysis doesn't help, then what does? What helps language acquisition is a method that is informed by sound theory. What helps more is to remember that this doesn't imply teaching the theory to you. You don't need to become a biochemist for antibiotics to work. Likewise, you don't need to become a linguist to learn foreign languages. Analysis is taxonomic (about members and sets). Therefore, a sound method must be meronomic (about parts and wholes). Analysis is computational (about derivations from rules). Therefore, a sound method must be creative (about creations without set rules). Analysis is deliberative (about organizing concepts). Therefore, a sound method must be autonomic (about raw observation). There is sound research in SLA and in "literacy therapies" (for ASD and dyslexia sufferers) that yields such a method. It's often called "visualization". The easiest way to summarize visualization is with two words — "directed imagination". The headword, "imagination", takes its etymological meaning. Imagination "makes an image" for us. All normal humans have this capacity. We can dream vividly. We can picture hypothetical scenarios. We can even recall memories. If we can see, these images are mainly visual, and our sound method will exploit this fact. Second is being "directed". Visualization isn't just random flashes of nonsense. Our images create meaningful, sequential scenes. Each of us gets a front-row seat in our own Cartesian theater. Again, our sound method will exploit this part of ourselves. Go to Dan Dennett for the analysis. One more thing we must consider is this: Visualization is pre-linguistic. That is, before we ever had words, we had the ability to direct our imaginations. Babies and dogs dream. If they had no such abilities, basic recognition (of mothers or masters) would be impossible. The corollary? Materials in a sound method have to be pre-linguistic. A learning session demands structure. That structure, though, can't force a specific form of language. It also can't encourage parroting already heard language. What causes both of those is the presence of linguistic input. Learners are too tempted to copy or paraphrase what they immediately hear or read. We're too tempted to accelerate past or skip the visualization and go straight to language. Remember, though, we want to create language (express thoughts individually) beyond just producing it (forming sentences). That, in turn, demands focus on our pre-linguistic state. A comic is worth 5,000 words. "What is that first rover doing?" "Can you describe the parachute?" "What does the second rover look like?" 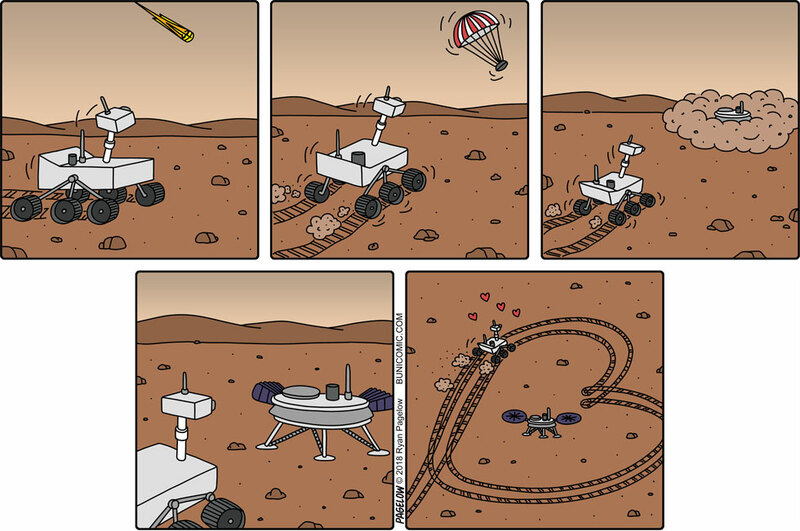 "How the first rover feel about 'her'?" "Where do these rovers meet?" "When did the second rover land?" "How many times does 'he' drive around 'her'?" "How did the second rover land on Mars?" "Why are there hearts around 'him'?" "What is 'he' driving around 'her' for?" "What do you recommend that the rover do to win 'her' love?" "How would things have unfolded if the second rover were 'male'?" In most sessions, first-order questions lead to first- and second-order responses, second-order questions lead to second- and third-order responses, etc. Either way, I just follow their level. I just need to be sure that my questions can be answered. Fourth-order questions allow for more liberty in the responses. There, coherence matters more than truth. Along the way, I give complete, native sentences reflecting what they said. Part by part, the learner describes the whole. I then remove the images. They must visualize their summary. They're not reciting it. They're creating it. They're saying what they're confident they can say. When they're stuck, I ask a question to help them recall their images. Then, at the very end, they get a transcript of a corrected summary. That's their input. The learners don't need vocabulary drills. They don't need a grammar lecture. They know what they said. They just then see how to say things more clearly. Analysts have obvious tells. They furrow their brows and focus their gazes. Visualizers have opposite tells. They raise their eyebrows and look askance. William: Is there a problem? Jamal: No, I'm just thinking. William: No, no, no. No thinking. That comes later. Thinking comes when you can teach yourself. You just need to save your analysis for the end. If you're not sure if you're ready, try The Pink Panther in your target language. 100% confidence in 95% of your output, that's your goal. Anything less, and you'll need a native to guide you.